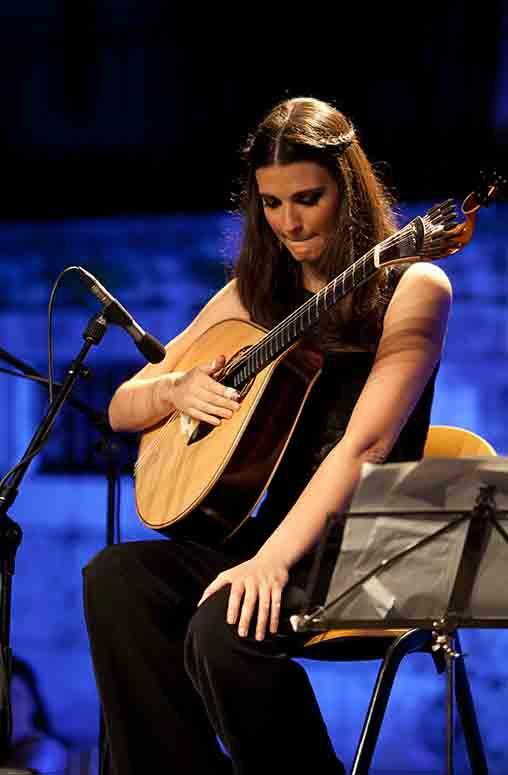 Marta Pereira da Costa (29) is the world’s first and only female professional Portuguese guitarist playing in the Fado genre. She started playing the piano at the age of 4. "My teacher at school noticed that I had a good sense of hearing and that I was a very interested pupil. He advised my parents to take piano lessons. I also studied the classical guitar. I was 8 years old when I started to study the classical guitar and I did that for 3 or 4 years. I just play the classical guitar for fun with friends every now and then. Still, nowadays, I am playing the piano again, I am working on recovering my repertoire." "It's very hard to play the Portuguese guitar in the beginning"
After completing her music studies at the age of 18, she was taught to play the Portuguese guitar by Carlos Gonçalves, one of the most important guitarists accompanying the Queen of Fado, Amália Rodrigues. It was her father who encouraged her to play Fado songs on the Portuguese guitar. Marta: "He stimulated me to go and take guitar lessons with the great guitarist Carlos Gonçalves. I studied 2 or 3 years with Carlos. It was of course a great honour to know him and to have him as my teacher. He plays a very important role in the history of the Portuguese guitar. It is difficult to play the Portuguese guitar the first years. It's hard to get a good sound, the strings are very thin and have a high tension, what makes it sometimes painful when you press them. On the other hand you have to use special nail pics while playing. And there is of course a special finger technique which might seem impossible and confusing in the beginning." "I just fell in love with Fado"
At a certain moment Marta began to frequent the famous Fado house in Lisbon, 'Clube de Fado', where she learned from masters like Mário Pacheco and Fontes Rocha and accompanied several famous singers that frequented the venue. Marta enthuses: "I just fell in love with Fado after my first Portuguese guitar lessons and after my first contacts with the Fado scene, Fado houses, musicians and Fado singers. I knew Fado before .... but I thought that Fado was for older people, so I was not interested in getting to know it better. But I also fell in love with the sound of the Portuguese guitar." Marta Pereira da Costa accompanying her husband, Fado singer Rodrigo Costa Félix. Marta then had the opportunity to play with names like Mariza, Camané and Carlos do Carmo, her first experiences on stage. She became a member of Mário Pacheco’s musical group and participated in many concerts in Portugal and abroad, mainly after the recording of his album 'Clube de Fado – a Música e a Guitarra', acclaimed by Songlines magazine as the best of World Music in 2005. She also participated in Jaime Roldán’s CD 'Unidad de Canciones Intensivas', in the theme 'Pasa'. In 2008, she played in the theme 'Mãe' from her husband’s (Rodrigo Costa Félix) CD 'Fados d’Alma'. Marta also recorded the music for the Portuguese guitar for Rodrigo’s 'Fados de Amor', released in May 2012. This is the first album in the history of Fado where the Portuguese guitar is played solely by a woman and won the title Fado Album of The Year attributed by Fundação Amália Rodrigues. Marta: "Besides accompanying other musicians, I have my own solo performances. I played in Lisbon, Madrid, Toronto, Paris and Ljubljana. With my music, I try to travel through the history of the Portuguese guitar, interpreting themes from great guitarists who inspired me, like Carlos Paeredes, Armandinho or Mário Pacheco. From the past to the present and I also play my own compositions. I usually perform, accompanied by a classical guitar - or viola de fado as we call it - and a double bass and I may include guest singers or other musicians. Pedro Pinhal has been working with me since my solo debut in Toronto and we get along musically very well, which is essential when you are improvising music." 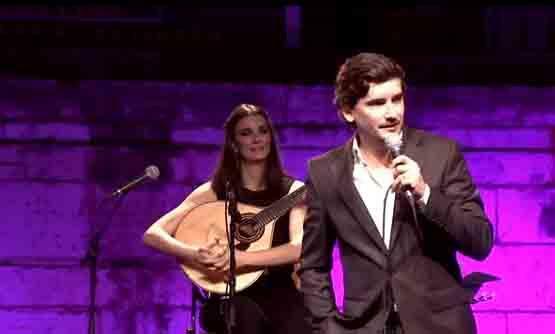 Fado expresses the life and soul of Portugal. It is a highly artistic form of singing, which was previously only heard in the country's poorer types of bars. During the twentieth century, it was performed in more 'respectable' entertainment venues, and received further recognition. Fado occupies a special place in the lives of many Portuguese people. It enables them to give voice to their inner feelings about life: moods of sorrow, melancholy, happiness - emotions which the Portuguese sum up in one word: saudade. It can also generate a party spirit. Amália Rodrigues is generally considered to be one of the most important and influential Fado singers. Marta: "Fado talks about daily life of Portuguese people, from the past, till the present. Fado talks about emotions like joy, love and the most intense pain. The singer has to open his soul to others when he sings a poem and conveys the truth of his emotions to the audience. Not all good singers are 'Fadistas', but Fado runs in the Portuguese veins. The Portuguese guitar has a unique timbre and that also helps to give Fado a unique 'flavour' Unfortunately, I was not into Fado when Amália Rodrigues was performing. I started to play the Portuguese guitar later, and went to concerts of Mariza, Carlos do Carmo, Camané, Katia Guerreiro and Ana Moura, the most important Fado singers nowadays." The Portuguese guitar is a plucked string instrument with twelve steel strings, strung in six courses comprising two strings each and with a pear-shaped, wooden sound-box. It is most notably associated with Fado music. The guitar is used for solo music as well as for accompaniment, and nowadays its wide repertoire is often presented in concert halls and in the context of classical and world music festivals all around the world. The Portuguese guitar is derived from the English guitar. Instrument builders in Portugal were mainly occupied with making citterns and lutes. However, over time these instruments were used less and so the Portuguese started to use (imported) English guitars, which had a bigger musical range. In former days the instrument was played with a plectrum, but today the players use a finger plectrum that is attached to their nails. "The sound of the Portuguese guitar is magical"
Marta: "I play the Portuguese guitar, because I love music and I love to discover instruments. If I could, I would learn how to play them all. The fact that it is not common to see women playing the Portuguese guitar, made me want to try and play it. So I challenged myself to play the instrument. Its sound is magical and unique. It is very hard to play though, but it is worth it. The repertoire for the Portuguese guitar is amazing, so much variety from the most intense and emotional melodies to our most lively and rhythm folklore songs." In 2012 Marta decided to leave her job as a civil engineer and dedicate herself exclusively to music, becoming a fullt-time professional. In March that year she gave her first concert as a soloist at 'Hug's Room' in Toronto, returning one year later to perform with her husband at a sold out 'Casa do Alentejo'. Then, in June, she performed at the Portuguese Embassy in Ljubljana (Slovenia), returning in October with Rodrigo for the Festival 'Days of Lusophony'. Also in June, she gave her first self-titled performance in Lisbon as part of the programme of the 'Festas de Lisboa', where she invited special guests to join her such as Katia Guerreiro, Marco Rodrigues, Adriana and Rodrigo Costa Félix. This concert was a huge success, widely appreciated and vibrantly applauded by hundreds of spectators. In the same month, she performed in Madrid at Teatros del Canal for the II Fado Festival in a concert directed by her husband called 'Casa de Fados – Uma Noite em Lisboa' and returned later that year for the III Fado Festival as a special guest for star guitarist José Manuel Neto. Then, in July, she and Rodrigo performed together at a fully booked CCB for the debut concert of the country-wide 'Fados de Amor' tour. 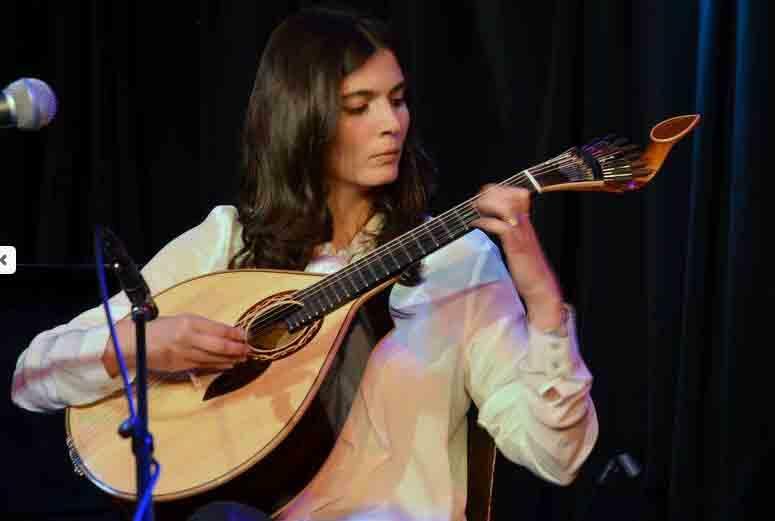 Marta Pereira da Costa accompanies Fado singers and plays essentially Fado music in her concerts, although she believes the Portuguese guitar has a great potential to mingle with other musical styles. She toured a lot in other countries, such as Spain, France, the USA, Canada, Brazil, Slovenia, Switzerland and Holland, where she played with the famous guitarist Mário Pacheco. In the near future she will be playing in Israel, Romania and Greece. She is also preparing to record her first solo CD to be released next year.